their vines dried and their roots driven deep into slumber. and look forward to a wet spring and a warm summer? Do they yearn for another year, to bear again their bitter fruit? and placed aright by love’s design? and am thinking, was it ever there at all? It was actually on a bicycle ride when the scent of wild grapes hit us, so it is a small exercise of my artistic license to switch it to the simpler idea of a walk. It so happened that just after the grapes we climbed a miserable hill, the kind that is fun to mock afterwards but which you dread before you go up it—the long, steep and panting kind. But still, I was grateful: that hill afforded me a lot of time to think about those grapes. Thank you for reading An early fall walk in the evening. I humbly appreciate your visiting the Book of Pain, and as always, I look forward to your comments. 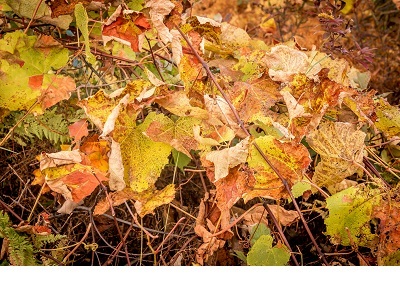 The photograph is of some wild grapes in the fall, taken at the Quabbin Reservoir in Massachusetts. To see my photography, please visit the Book of Bokeh blog. I live surrounded by vineyards, John. Your poem captures stages and fragrance and symbolism so eloquently, Smile. Thank you, dear! I am ‘surrounded’ by two vines, a concord and a pink princess, both seedless. For some reason I cannot explain, the ‘crop’ this year was 3 times what it had ever been before hand! 🙂 Oddly though, I only get the scent of grapes from the wild vines which are rampant in some places in this area…so when I caught it that day it really impressed itself on me. I am jealous that you have so many vineyards around you. That makes me guess two of the most wonderful places in the world: Sonoma and Napa or close by. How’d I do? So much to love about this poem John, beautiful! Thank you. Thank you! And it is wonderful to have you and your incredibly sensitive poetry back!